It’s only been two days since the Vegetarian Challenge ended, but my stomach is already like, “Whoa girl, take it easy. I thought I told you before not to change things up so suddenly!” Fair enough, stomach. Here is some high-fiber bean-filled goodness to make it up to you. 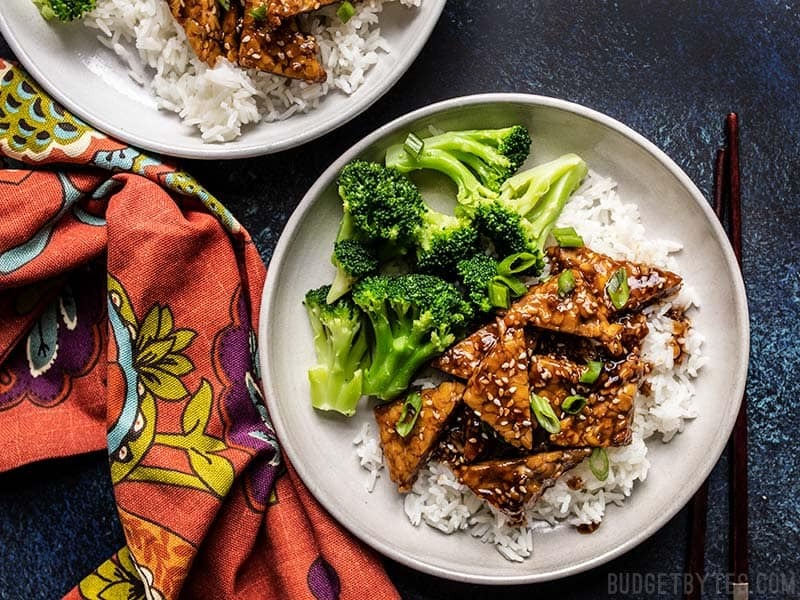 I saw that tempeh was on sale today, so I took the opportunity to make this recipe for Sesame Tempeh Bowls that I’ve had waiting in the wings. This is basically the same recipe as my Easy Sesame Chicken, but it’s even easier because I didn’t bother coating the tempeh in any sort of egg wash. Just a quick simmer in water to plump it up, then the sauce goes in, and you’re DONE. 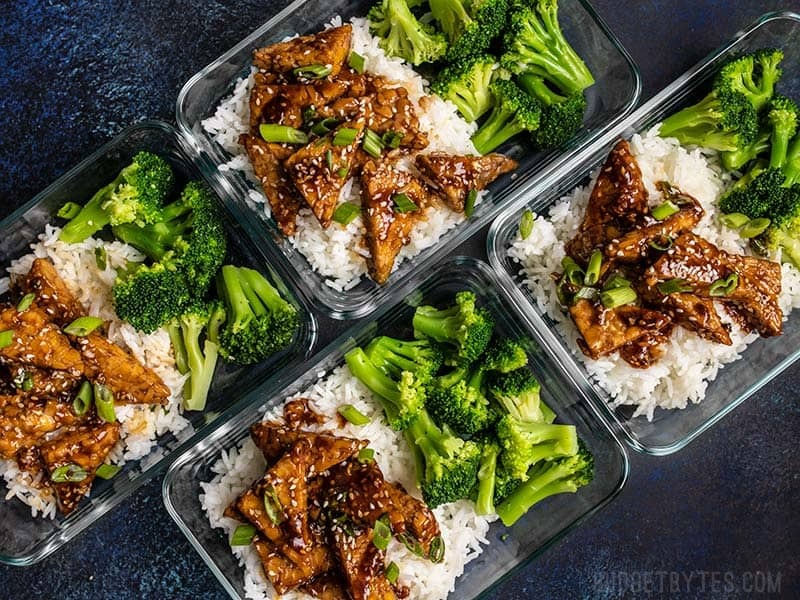 If you’re looking for the easiest of easy meal preps, this is it. 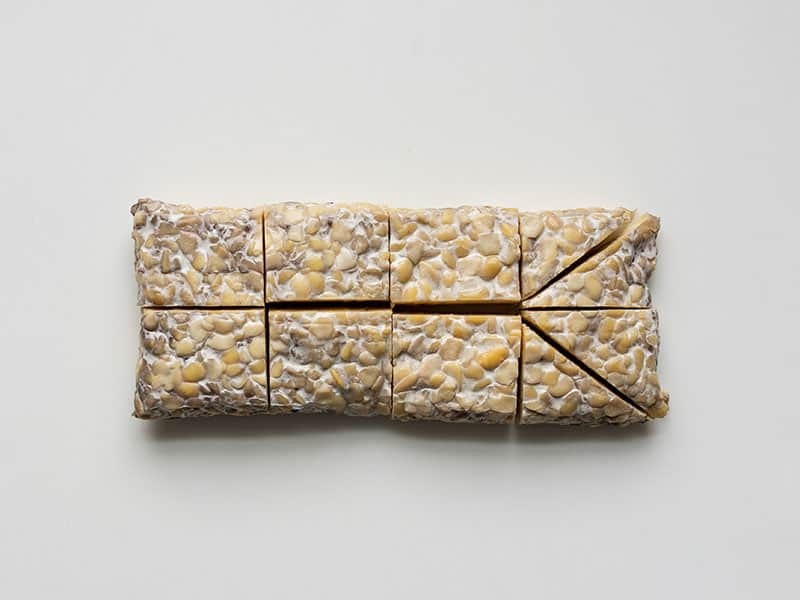 Tempeh is a compressed cake of fermented soy beans. It sounds a little weird, but I promise it’s awesome. It has a fairly neutral taste (a slight bitterness, if anything) and it absorbs the flavor of whatever sauce you pour over top. It’s a fantastic source of plant-based protein, fiber, and other nutrients, and has a much more firm texture than tofu. Because it is more firm, I find it works better than tofu for stir fry. I used frozen broccoli florets for these bowls because they’re just so easy. I simply let them thaw and add them to the bowls. Frozen broccoli is blanched before freezing, so they’re already partially cooked. They’ll finish cooking when I reheat my meal prep. If you prefer to use fresh, simply steam or boil them for a few minutes, or just until al dente. 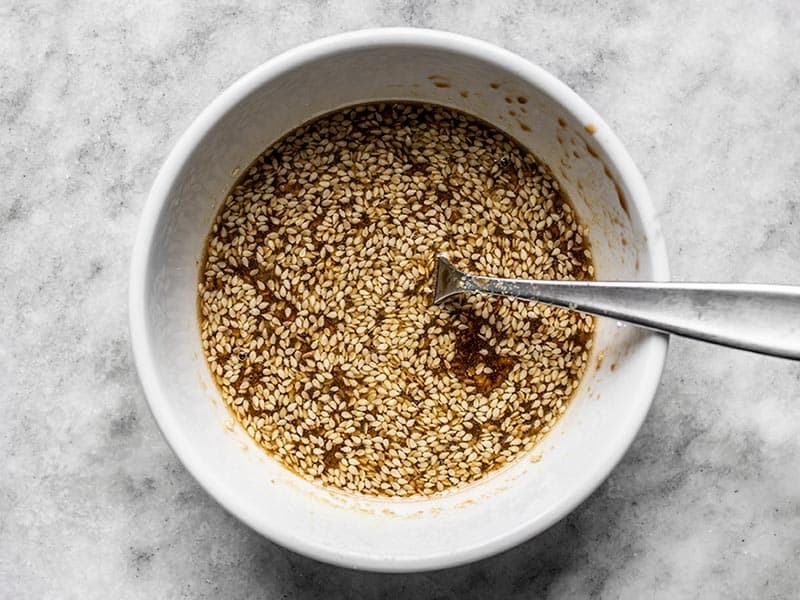 Begin by mixing together the sesame sauce. 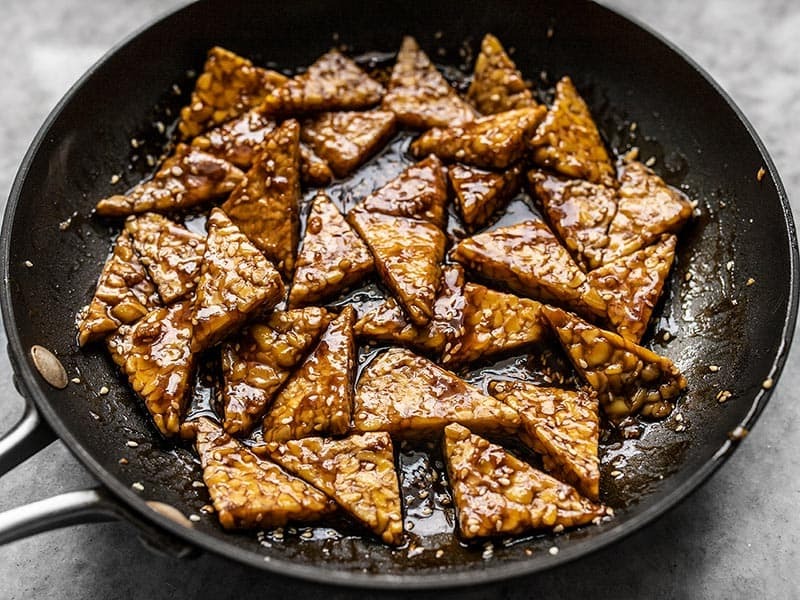 In a medium bowl, stir together the soy sauce, 2 Tbsp water, sesame oil, brown sugar, rice vinegar, grated ginger, minced garlic, sesame seeds, and cornstarch until the cornstarch is dissolved. Set the sauce aside. 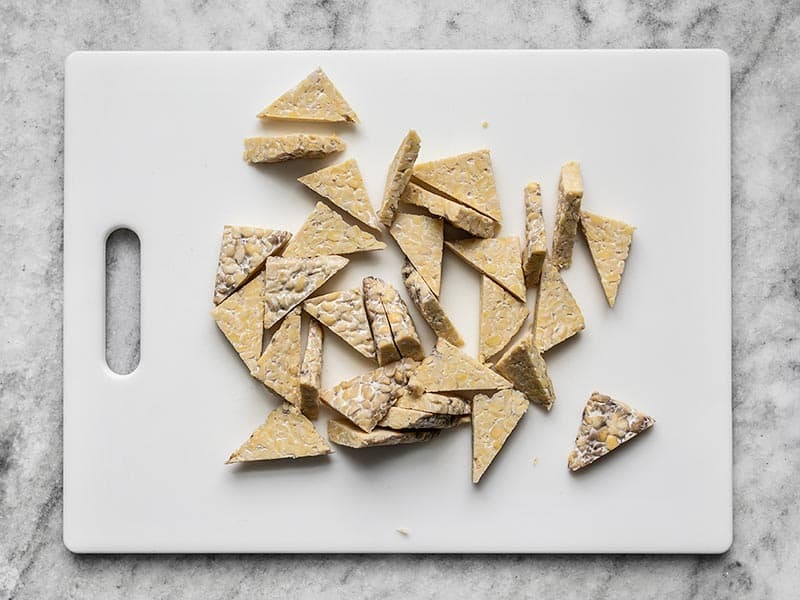 Cut the brick of tempeh into 8 squares, then cut each square diagonally into a triangle. Turn each triangle on its side and slice it in half so you have two thinner triangles. To achieve the proper tempeh to sauce ratio, you don't want thick pieces. Place the tempeh in a large skillet and add 1/2 cup water. Place the skillet over medium-high heat and let the tempeh simmer until all of the water evaporates (about 5-8 minutes). Flip the tempeh a couple times as it simmers. 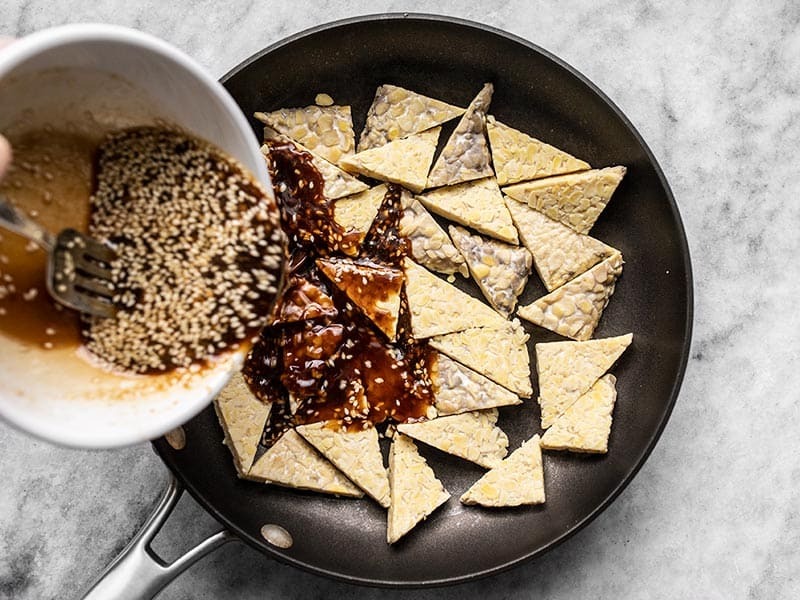 Once the water has evaporated, turn the heat down to medium and pour in the sesame sauce. The skillet will still be quite hot, so the sauce may begin to thicken immediately. Stir the tempeh in the sauce until the sauce has thickened (1-2 minutes), then remove it from the heat immediately to prevent further evaporation and thickening. 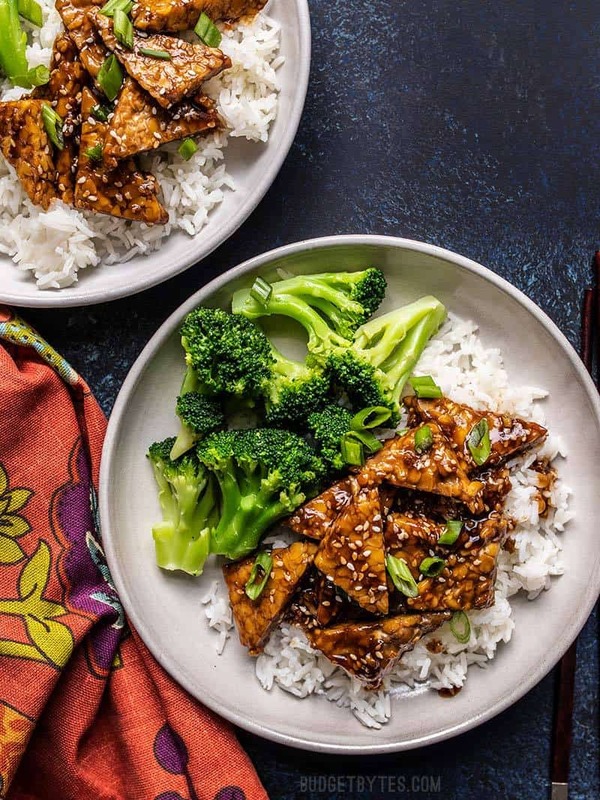 To build the bowls, place one cup of rice in each dish, top with 1/4 of the sesame tempeh, 1/4 of the broccoli florets, and a sprinkle of green onion. *You can sub brown rice or plain white rice if desired. Begin by making the sesame sauce. 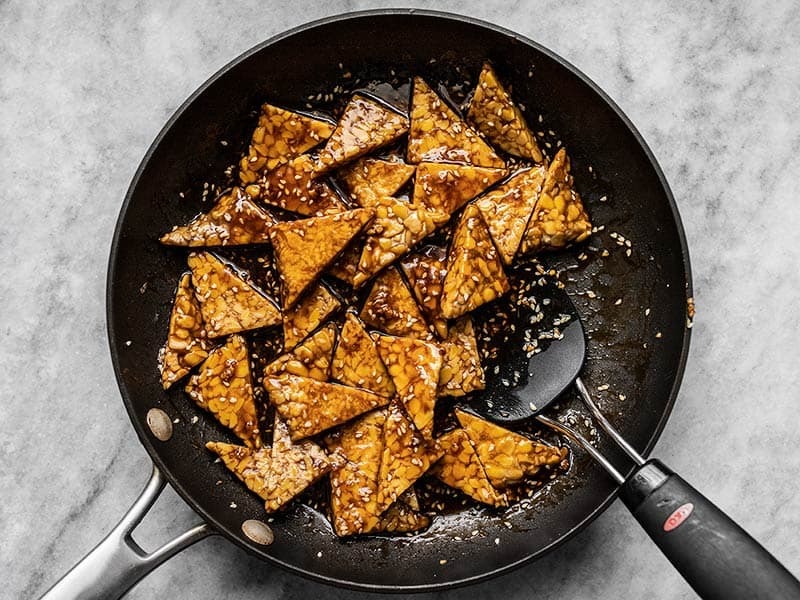 In a medium bowl stir together 1/4 cup soy sauce, 2 Tbsp water, 1 Tbsp sesame oil, 3 Tbsp brown sugar, 1 Tbsp rice vinegar, about 1 tsp grated fresh ginger, 2 cloves of garlic (minced), 1 Tbsp sesame seeds, and 1/2 Tbsp cornstarch. Stir them together until the cornstarch is dissolved, then set the sauce aside. Then turn each triangle on its side and slice it in half to make two thinner triangles. You want thin pieces to get the sauce to tempeh ratio right. 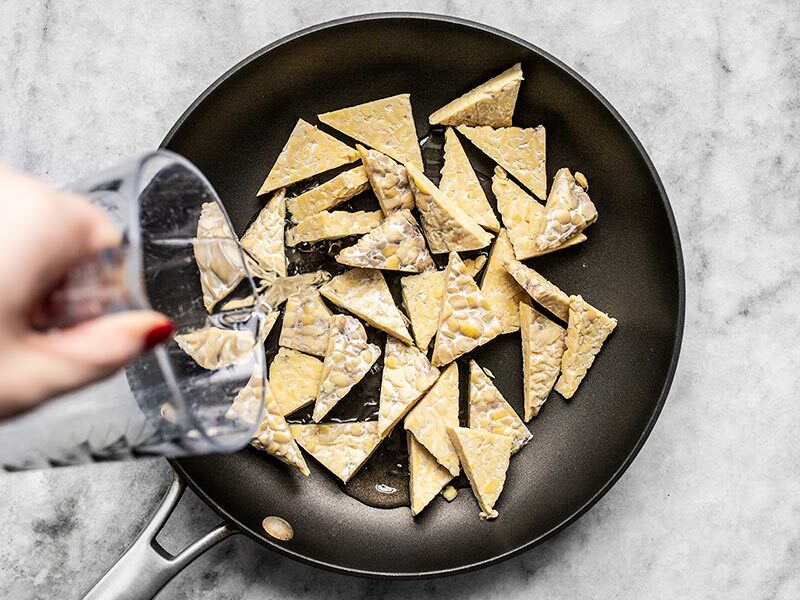 Place the tempeh in a large skillet and add 1/2 cup water. Place the skillet over medium-high heat and let the tempeh simmer until all of the water is evaporated (about 5-8 minutes). Flip the tempeh a couple of times as it simmers. Simmering the tempeh makes it a bit more tender. Once the tempeh has simmered and all of the water has evaporated, turn the heat down to medium and add the sesame sauce. The sesame sauce will begin to thicken as it heats, so stir the tempeh in the sauce for 1-2 minutes, or just until thickened. Remove the skillet from the heat as soon as it has thickened or else the water will continue to evaporate and the sauce will become too thick. Now you have delicious sesame tempeh that only took about 10 minutes! To build the bowls place one cup cooked rice in each dish and top with 1/4 of the sesame tempeh and the sauce. Add 1/4 of the broccoli florets on the side, and sprinkle a few sliced green onions over top. Finished! I packed mine up in meal prep containers for the week! 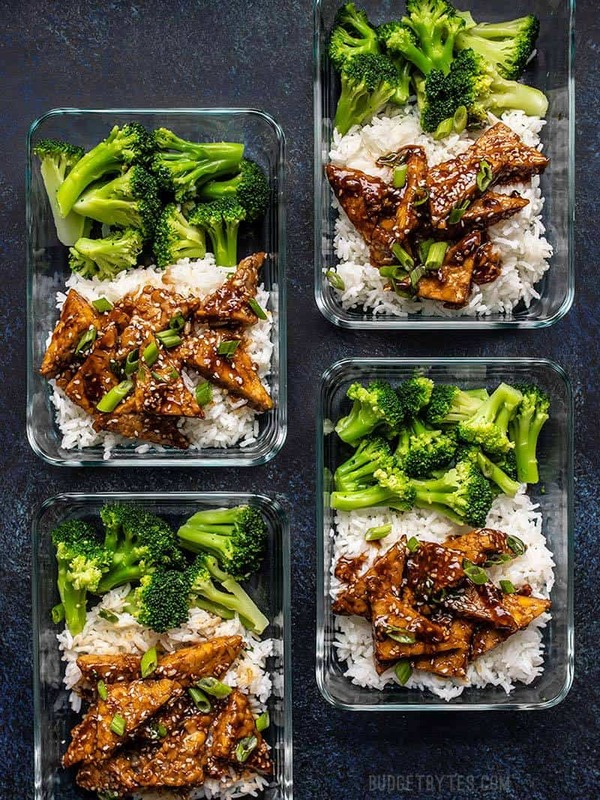 You can find these Pyrex 3-cup Rectangle Glass Meal Prep Containers in my Amazon Shop. I really enjoyed this! I’d never made tempeh before, but my husband is trying to eat less meat so this recipe came along at the perfect time. The tempeh was really easy to work with, so much easier than tofu, which I don’t like working with at all. And the sauce was *amazing. * I think next time I make this, I’ll try making a little more sauce so it can hopefully coat the broccoli a bit more. Someone else mentioned it being too salty, and I wonder if they used full sodium soy sauce? I always buy reduced sodium soy sauce and thought this was a good level of salty using that. I like this or found it okay, but my husband found the tempeh with the sauce entirely too salty! In his opinion the amount of soy sauce used was too high! I made this as instructed, and it was absolutely delicious. 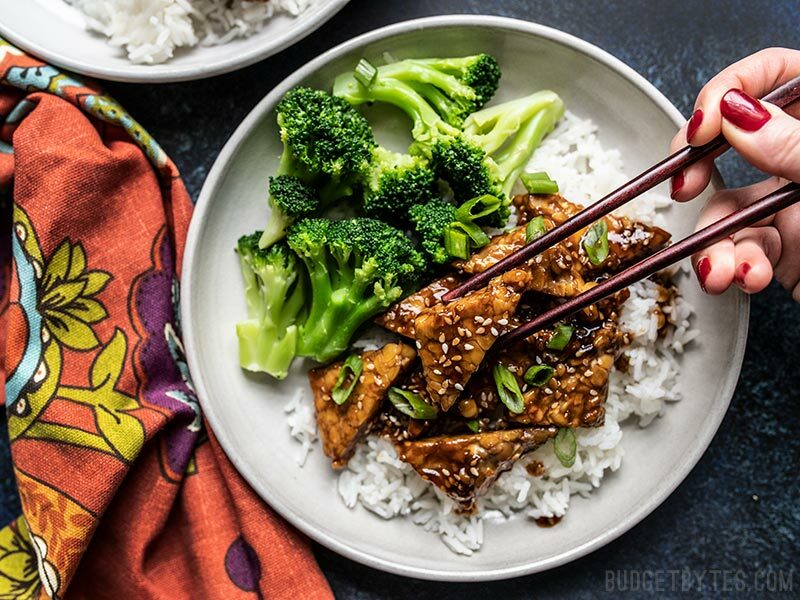 Great use of tempeh with great sauce. Added some hot sauce to the final product. First time having tempeh, I used trader joe’s Organic. I don’t think I’m a huge fan of tempeh but liked the recipe and loved the sauce. My husband and I are it as a dinner tho so we didn’t get 4 servings out of it. This was quick! I meal prepped mine too. I threw some leftover kale in one container, and wished I’d had enough for all four. The sauce went really well with it. It was delicious over both sushi rice and brown jasmine rice. I did alter the sauce by cutting back the sugar.